In need of a short stay? While we normally require a minimum of 5 nights, gaps between bookings of 4 nights or less can now be booked online if you fill the entire gap. Just specify your dates and the number of occupants in the form above and click "Book It" to obtain a detailed quote and/or reserve this unit. You can also click "send email" to receive an automated quote matching your circumstances or to submit any questions you may have about this unit. The automated quote will also describe alternatives for reserving this unit directly with our rental office if you prefer. Step back in Maui time, and visit romantic old Hawai’i during your stay at this unique condo lovingly referred to as the “Mermaid Cove”. the tropical and colorful décor will welcome you. To our guests delight, the water’s edge is 50 ft. from the lanai. This unit has reflecting mirrors which offer views of the ocean from the kitchen, living room and dinette table (not shown in these pictures). 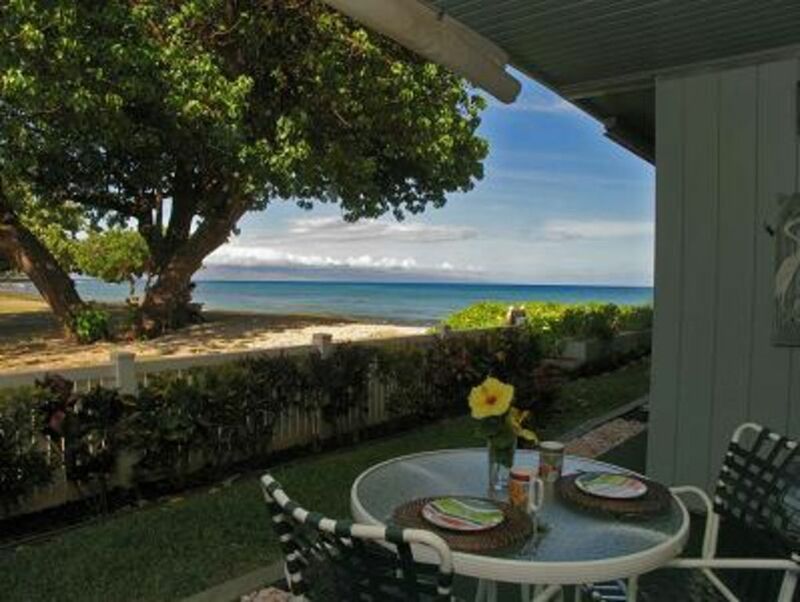 From the lanai, you will experience sunsets, low reef tide pools, gentle surf and spectacular views of Lanai and Molokai, Maui’s outer islands. Instead of a flat ocean horizon, every day the cloud patterns change over these 3 islands. You will also be able to look across to the park and watch people carry their outrigger canoes, spear fishing gear and kite boards to the sea. The green sea turtles (Honu) feed off the reef and, in the winter, the humpback whales arrive from Alaska and can be seen from the pool deck. For your added comfort, we supply beach towels, hair dryers, a CD music library and DVD player, free WI-FI, free parking, BBQ’s close to the pool deck, custom king bed and sofa bed in the living room. Sleep with the Hawaiian trade winds blowing through this heavenly condo. In this vacation unit, the breezes blow from north to south through the tropical louver windows and the front door through to the lanai; ceiling fans offer additional comfort. Relax on the lanai with your morning latte’ (available at the nearby Farmer’s Market). Sunset cocktails and pupus are fun on your lanai or pool side, which is right on the ocean and just a few steps from the front door. While there are so many things to do when visiting Maui, you may just want to lounge by the pool or under a palm tree with a good book. Come join us! Rates for this unit are based on two occupants, (additional $10/night/person), and also vary depending on season, length of stay, and whether booked at the last moment. Please specify your desired dates and number of occupants above to obtain a quote for your specific circumstances. Managed by HKR LLC, Hawaii Tax ID #: TA GE 081-380-3520-01. My husband and I kept remarking during our whole trip to Maui how lucky we were to find this condo. The photos shown don't do it justice--you are even closer to the water than it appears, about 15 paces. At night, the sound of gently crashing waves lull you to sleep. In the morning, watch whales breaching and turtles flailing in the surf as you eat breakfast on the lanai. Lana'i can literally be seen from the lanai. Whereas all nearby condos are built-up high rises, Hale Kai is only 2-3 stories, and is adjacent to a cute beach park with small shops across the street, so it feels like a little quaint oasis in an otherwise sprawling area. Inside the condo, we had everything we needed. Some areas from improvement include giving the fixtures a good scrubbing, as they were a bit sticky. It would have also been nice to have a bit hotter water in the shower. Overall, an excellent price and a wonderful experience. So glad it was available on such short notice. I would return there in a second. Great, relaxing, good people, and a great pool. I've stayed at the Hale Kai a number of times over the past ten years, and we love it! This unit was very compfortable. I enjoy the view of the park and being steps to the pool. Any issues that came up were quickly addressed by the office staff. We'll be back! The location is very nice, you're situated next to a park, just a few units from total ocean front. Great ocean views from the lanai and interior thanks to a well planned wall mirror, and some ocean views from the master bedroom. Close to all the great Northwest sites. Comfortable bed. The negatives: Kitchen and bathroom in sore need of an update, they look decades old. Hot/cold water in the shower is terrible, you really can't take a comfortable shower because the temperature is constantly changing. We had to kill lots of roaches, although the office did have the unit sprayed which helped for a few days but then the little buggers were back. For the money it's a good value but I personally wouldn't stay there again, mostly because the roach problem. This was the cutest little condo ever. It has everything you need including beach towels, and beach chairs. 10 steps to the beach or 30 seconds to the pool. Bad *** coffee is right across the street. I loved the location. Out of the hustle and bustle of Lahaina but less then 10 minutes away to go exploring..